So as I write this I have just submitted my last ever college “homework assignment” and man, is it ever a great feeling. I promised far more updates on this car than I have been able to follow through on, but I have been documenting and taking pictures of projects and progress on the Volvo and plan on updating more now. I have actually reached my goal of a reliable and drivable car by May. The car may not drive that great, but that is something I can work on moving forward. So the first, and one of the biggest projects I have tacked with the Volvo recently are fueling issues. I mentioned in my last post about some “hack job” fuel line repairs near the fuel tank, and I recently discovered that there was more “hack jobbery” near the in-line fuel pump under the car as well. Upon further inspection I found that a large portion of the high pressure line and all of the fuel return line were corroded and leaking. The previous owner’s mechanic probably was patching up portions of the line as they failed, thus the strange portions of line and different (mostly incorrect) types of line. Essentially one day I walked up to the car, started it, it had an incredibly bad stumble, and then I smelled gas. A lot of gas. So I quickly shut the car off and looked underneath to find a puddle of gas forming. Again. This time I was going to fix it the right way, all the way through the car. I know fuel lines aren’t the most exciting repair in the world, so I’ll try and keep this brief. The first thing I did was get under the car and inspect the leaking area to try and find out what was going on. To my surprise the high pressure fuel lines were not metal or rubber, but plastic. At first this confused me, I expected to see rusted through metal lines or dry-rotted rubber lines, but this was not the case. Volvo had installed these green nylon(?) 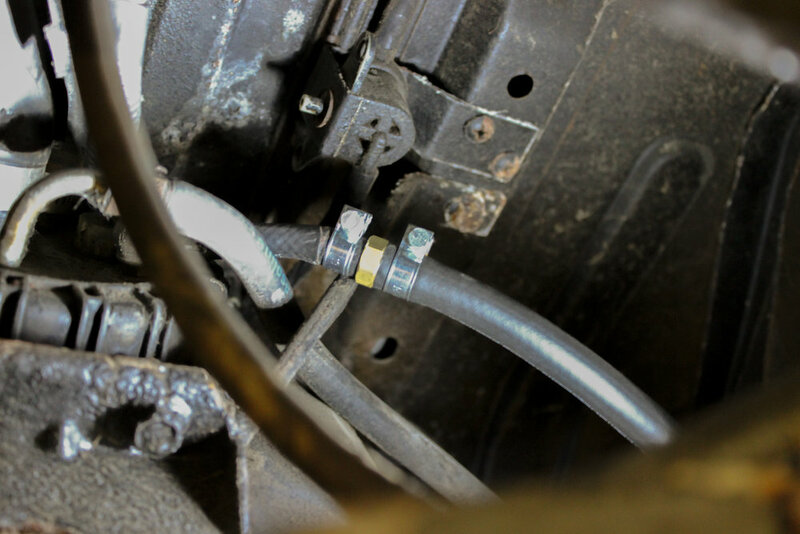 fuel lines to both deliver and return fuel prior to the secondary fuel pump under the body. I cannot say for certain, but I feel that this may have something to do with the ethanol fuel content in current gas. Don’t get me wrong, I love the stuff, but I think that this is something Volvo had not intended to pump long term through these nylon lines. The lines were almost seeping gas and I could not find any cracks or breaks that I could pinpoint the leak to. 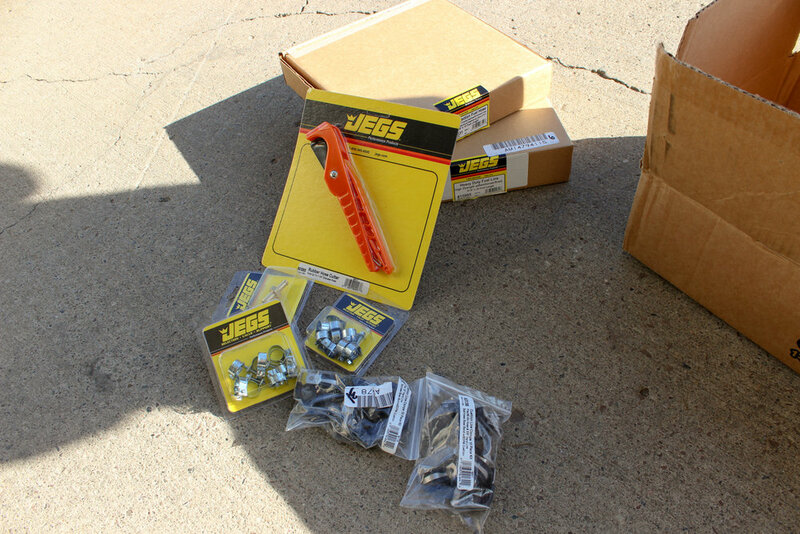 I quickly decided that I didn’t want to try and run nylon lines again or go through the struggle of bending and running new steel lines on a car of this “caliber”, so I hit up Jegs for some parts. After some measuring I determined I would be able to get away with about 10 feet of 3/8” high pressure fuel line (R9 if anyone cares), 20 feet of 5/16” fuel line to act as the return line (R7), a difficult to find 5/16”-3/8" hose adapter, some fuel hose clamps, some cushion clams, and my personal favorite a fuel hose cutting tool. I started by ripping out all of the old line, and unfortunately whatever old fuel line mounts were left came with it. Luckily I purchased the cushion clamps for just this situation. I then started to run the feed line from the tank first. After removal of the old line I found this strange homemade adapter out of what looks to be two hose barbs soldered(?) together. 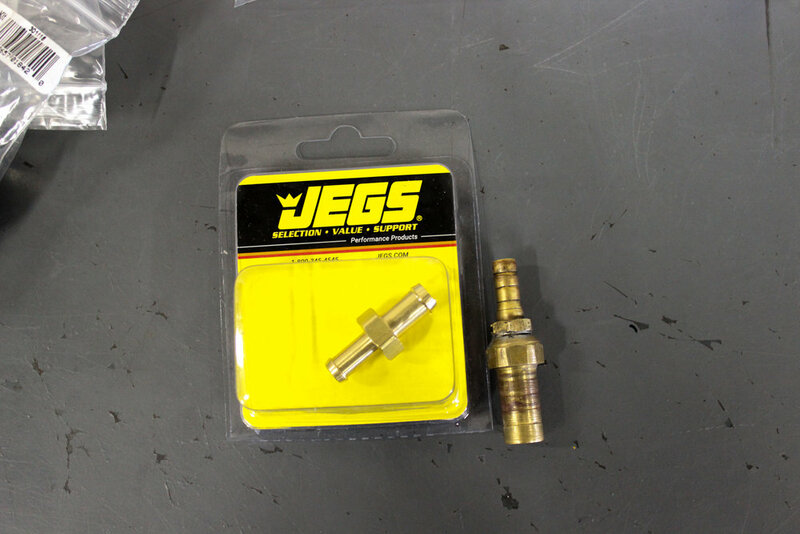 Luckily the Jeg’s adapter replaced it with a much better looking unit. I tried my best to locate both the line and the cushion clamps as close to the stock locations as possible. The diameter of the new rubber line was slightly larger than the stock nylon line, so it’s a little tight to the driveshaft in some spots, but I made sure it clearanced properly. The return line was actually much easier as on both the fuel tank and engine side it already ended in 5/16” rubber fuel line so all I had to do was remove the clamps on either side, pull the nylon line and original mounts, and then replace it with new line. I also used cushion clamps for the return side to clean up the install. After that I tightened the clamps on all the new lines, lowered the car down, and after a couple of cranks to get the fuel through the new lines, it started right up. Overall this was a fairly easy job, it just took a lot of preparation to make sure that everything was correct so the install would go smoothly. Stay tuned for another update soon on headlight restoration, a cheap project that made a drastic improvement on both the car's appearance and visibility.